The 2018 America the Beautiful Quarters are soon to be released, and coin collectors are already buzzing about the designs that will appear on these new quarters. The America the Beautiful Quarters, which were first released in 2010, enter their ninth year in 2018. The program honors one national park or national landmark from each of the 50 states and U.S. territories in the order in which they were established. 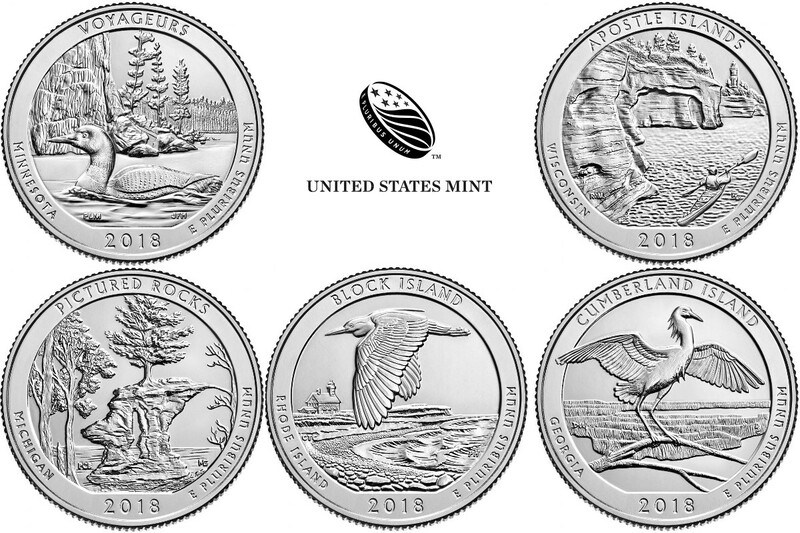 In the case of the 2018 quarters, a common theme that collectors will find across many of the new designs is the inclusion of birds. Of course, these coins aren't just for the birds! Trees, rock formations, shorelines, and other natural features play starring roles on the 2018 quarters. 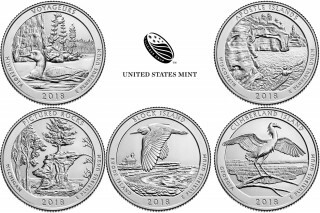 Pictured Rocks National Lakeshore, Michigan – This 2018 quarter designed by Paul C. Balan and engraved by Michael Gaudioso features Chapel Rock and white pine trees. Apostle Islands National Lakeshore, Wisconsin – Richard Masters designed and Renata Gordon engraved this 2018 quarter, which showcases the sea caves of Devils Island, a lighthouse, an a kayaker. Voyageurs National Park, Minnesota – A common loon and rocky cliff grace the reverse (tail's side) of this 2018 quarter designed by Patricia Lucas-Morris and engraved Joseph Menna. Cumberland Island National Seashore, Georgia – A snowy egret and a salt marsh are the main subjects on this 2018 quarter, which was designed by Donna Weaver and engraved by Don Everhart. Block Island National Wildlife Refuge, Rhode Island – A black-crowned night heron flying over the beaches of Cow Cave near Sandy Point anchors the reverse of this 2018 quarter designed by Chris Costello and engraved by Phebe Hemphill. The obverse, or "head's side," of the 2018 quarters include a portrait of George Washington that has appeared on the quarter since 1932 and was modified in 1999. The bust was originally designed by John Flanagan and was enhanced in 1999 for the release of the first 50 States Quarters. The America the Beautiful Quarters program was authorized under Public Law 110-456. Five new quarters will be released each year until 2020, and one final quarter will be released in 2021. At that time, United States government officials may decide to authorize another large-scale quarter design program or establish a single new permanent reverse design for the quarter. Coin collectors have many options for acquiring examples of the 2018 America the Beautiful Quarters. The U.S. Mint issues uncirculated sets, proof sets, and other products that feature business-strike and collector versions of the 2018 quarters. They can also be found in circulation, where they can be obtained for face value.